These days I often have leftover pumpkin puree hanging around. Usually I add it into pancake batter, but I was feeling the gingerbread urge coming on and the two seemed an obvious match. I like my gingerbread on the less sweet side—moist, dark, and spicy, with molasses and ginger. A dusting of powdered sugar at the end gives it the perfect balance. This makes a lovely tea time treat, though I can definitely see having it with coffee first thing in the morning. 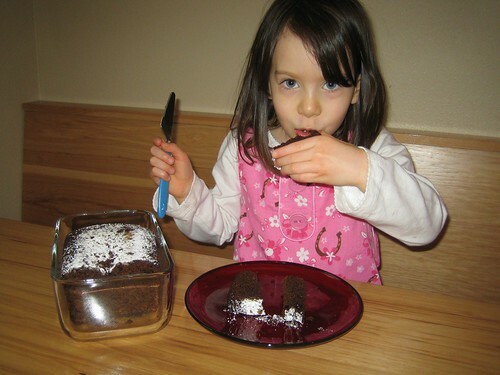 Hmm, might have to do that tomorrow, after Anna's at school and there's no one to see me eating cake for breakfast! Preheat over to 350 degrees F (175 C). Spray a 9x5 inch loaf pan with cooking spray*. Combine sugar, oil, molasses, pumpkin, and eggs: beat until smooth. Combine flour, soda, salt, baking powder, and spices. Stir into wet ingredients until just mixed. Pour into loaf pan and bake until center is set: about 1 hour, perhaps a bit more. Once cooled, place powdered sugar in a mesh strainer and tap over surface of gingerbread. Then try not to eat the entire thing in one sitting! * An alternative is to use a square baking pan, which would likely cut down on baking time since the cake wouldn't be as deep. Can't wait to try the latest batch! Could you please send to me your adress. Need it for the wedding invitation.